The La Niña and El Niño phases of the El Niño-Southern Oscillation (ENSO) have major impacts on regional rainfall patterns around the globe, with substantial environmental, societal and economic implications. Long-term perspectives on ENSO behaviour, under changing background conditions, are essential to anticipating how ENSO phases may respond under future climate scenarios. Here, we derive a 7700-year, quantitative precipitation record using carbon isotope ratios from a single species of leaf preserved in lake sediments from subtropical eastern Australia. We find a generally wet (more La Niña-like) mid-Holocene that shifted towards drier and more variable climates after 3200 cal. yr BP, primarily driven by increasing frequency and strength of the El Niño phase. Climate model simulations implicate a progressive orbitally-driven weakening of the Pacific Walker Circulation as contributing to this change. At centennial scales, high rainfall characterised the Little Ice Age (~1450–1850 CE) in subtropical eastern Australia, contrasting with oceanic proxies that suggest El Niño-like conditions prevail during this period. 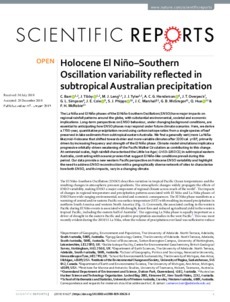 Our data provide a new western Pacific perspective on Holocene ENSO variability and highlight the need to address ENSO reconstruction with a geographically diverse network of sites to characterise how both ENSO, and its impacts, vary in a changing climate.